Spring is here and we are busy preparing for the upcoming growing season. 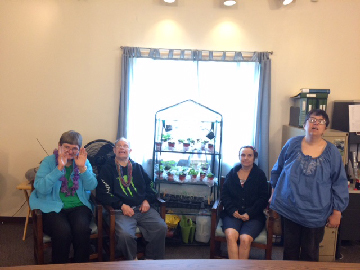 We are excited to expand our gardening endeavors into a new program called "Seeds of Ability". This program will continue to teach individuals with special needs about growing their own food, healthy eating and nature conservation. We have just broken ground for our new outdoor garden area. Our folks will be placing the herb and vegetable seedlings that they have started indoors, into the garden for a plentiful harvest this year. When you are cleaning out your barn, garage and/or sheds this spring think of SEEDS OF ABILITY to donate your gently used gardening supplies and equipment to (pots, gardening tools, seeds, fencing, greenhouse supplies, soil, compost, etc.). © 2013 Network, Inc. is an affirmative action/equal opprotunity provided and employer. Network, Inc is a 501(c) 3 nonprofit corporation.